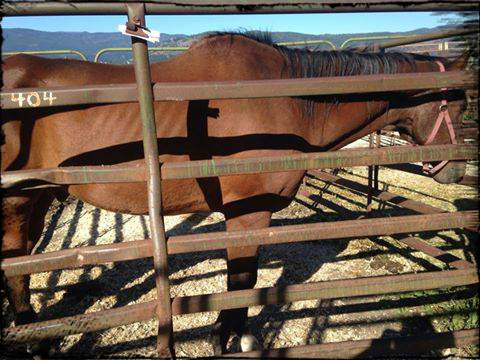 This photo, original to the Canadian Horse Defence Coalition, was used in a presentation critiquing horse advocates. The presenter claimed that criticism against feedlot owners was unjustified, they are really “not that bad.” The only criticism offered was towards the use of barb-wire fencing. In April I attended The National Animal Welfare Conference, offered by The Canadian Federation of Humane Societies. The CFHS represents all the humane societies and SPCAs across Canada. So as you would expect, the presentation consisted of a broad range topics related to cat overpopulation, animal shelter stats, hoarding issues, spay/neuter, along with some coverage of farm animal issues, including representation from OMAFRA and the Alberta SPCA on horse slaughter. I had been looking forward to this event for weeks…. Within the various humane groups, welfare standards, which vary considerably, are reviewed and debated worldwide. The humane societies and SPCAs do not even agree on the issue of what constitutes good welfare, despite the existence of codes of practice. This schism was made more obvious by the presence at the conference, of strict vegans juxtaposed against those who still justify eating animals but want to improve their welfare while doing so. 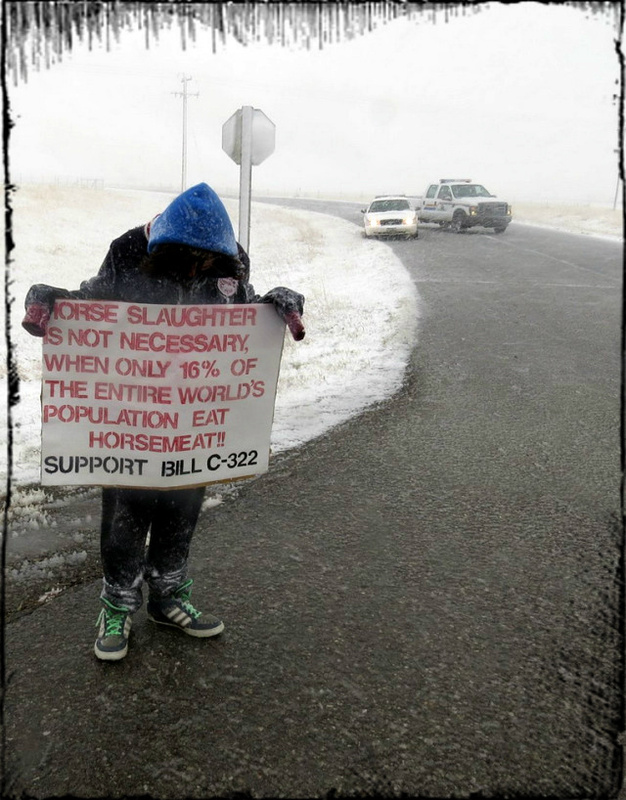 The bulk of horses in Canada are found in Alberta and anti-slaughter advocates have had challenges appealing to many people in that province due to the ranching and Stampede culture. Protesters at the recent Bouvry slaughterhouse in Alberta were subjected to strong negative feedback, to put it politely. 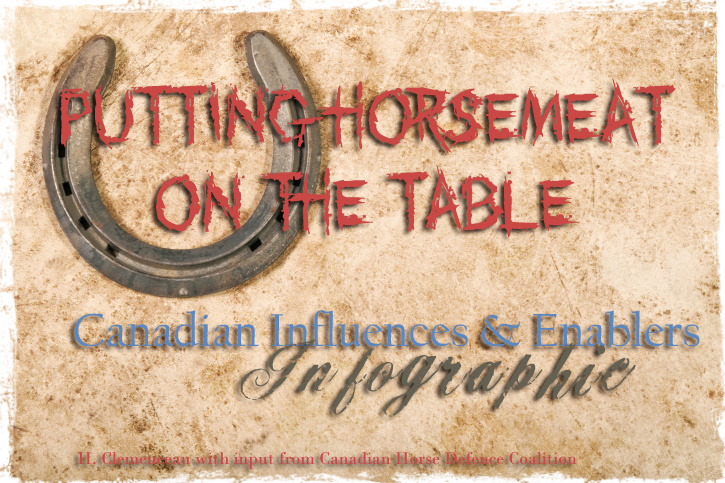 There is certainly a notable variation between the principles, opinions, sentiments regarding horse slaughter in Alberta and elsewhere in Canada. 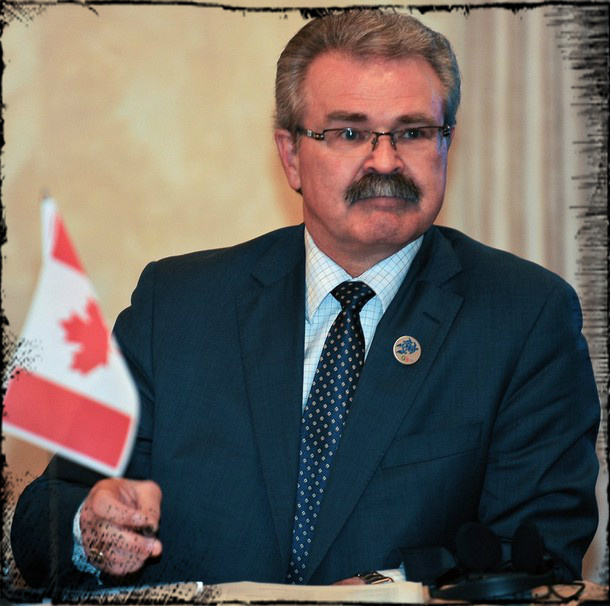 Knowing that at least one of the speakers on horse slaughter was from Alberta, I expected them to graywash the issue of slaughter – I must be psychic because that’s really how it played out. I believe that presenting horse slaughter as acceptable, safe, or humane, even grudgingly, is inconsistent with the values of a humane group or SPCA. There were two equine vets for this segment, each presenting for about 45 minutes. Dr. Marion Anderson – Alberta SPCA, presented first. She has a practice in Saskatoon and became President of the Alberta ASPCA in 2012. However, Dr. Anderson’s presentation conflicted with statements by the USDA and other groups that found that about 92% of all horses are young and healthy and capable of living longer lives. Her presentation can be viewed online at the CFHS site here and in PDF format here. The second presentation was made by Dr. Bettina Bobsien – she’s a vet in private practice who has worked with the BC SPCA on farm animal welfare issues and was a member of the committee that drafted the current Equine Code of Practice. Dr. Bobsien reminded the attendees that the new equine code of practice went from 25 statements up to about 75 statements which is obviously an improvement in welfare, albeit one that has no teeth because it’s a recommendation rather than a requirement. IMO, Dr. Bobsien’s presentation was a lot more problematic – probably not just for me but for others in the audience as well. 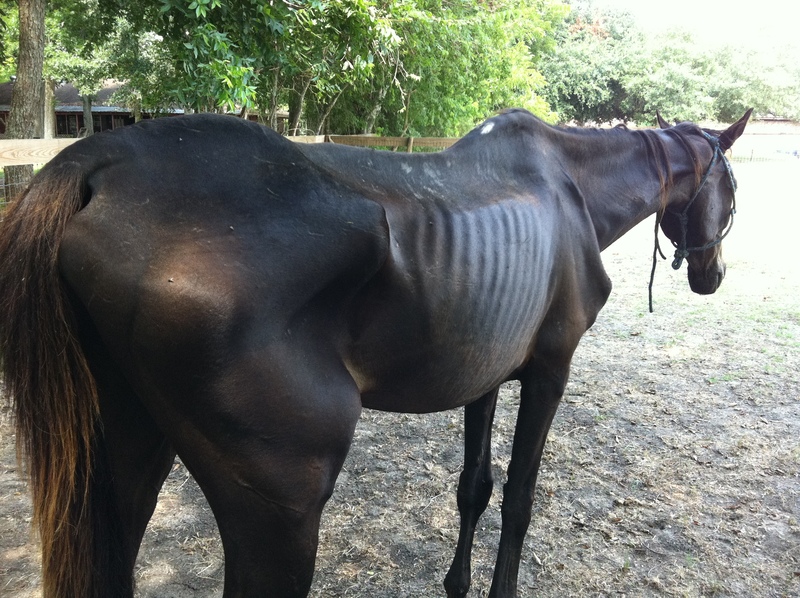 The Dr. took the approach that horse slaughter is necessary and much maligned by activists who spread “myths.” She spoke of unintended consequences for the US after the cessation of slaughter including starvation and abandonment, which have largely been debunked, perhaps most famously by John Holland of the Equine Welfare Alliance in the states. Deputy Broad went from the stable to the table in not 180 days, but in 7 days! As the presentation unfolded, I did a double-take when I saw on the projector, images from CHDC’s own website and blog being presented as “myths” about horse slaughter. Dr. Bobsien did not name the CHDC in her presentation though, and implored the audience to refrain from embracing “activist hysteria.” It is perhaps noteworthy that Dr. Bobsien’s conference slides have not been made available for downloading at the conference website. Perhaps it was due to the pushback from some audience members (myself included) who sought to correct some statements, or maybe the CFHS felt the slides were too controversial. So here are a few of Dr. Bobsien’s “Myths” of Horse Slaughter (the “myth” in bold, followed by Dr. Bobsien’s response in red, and my response in grey italics). Horses are or should be companion animals. We Have a special relationship with them. “They are livestock.” I think many horse owners have special relationships with horses just as they do with dogs and cats and other pets. They happen to live on farms due to their size and range requirements, but we spend thousands on board or on tack that isn’t spent on livestock. And we have a special relationship with horses historically that we simply don’t have with other animals. Horses treated with toxic chemicals mean that the meat is tainted – example: phenylbutazone: “Horses given bute are clear in 21 days and meat is fine to eat. The EU put restrictions on imported horse meat because of a claim about toxic meat in horses originating in Canada.” I did challenge Dr. Bobsien on this and she finally said that the science and the regulations don’t match up. Dr. Bobsien spoke about bute being kinetically withdrawn from the tissues within 21 days, but made no mention of the fact that the CFIA prohibits its use in food horses entirely. It’s the metabolized compound that can be found in tissues afterwards that can kill you. In a survey, 96% of respondents said they used nonsteroidal anti-inflammatory drugs (NSAIDs) to control the joint pain and inflammation in horses, and 82% administer them without always consulting their veterinarian. More than 1,400 horse owners and trainers were surveyed to better understand attitudes toward NSAIDs. Additionally, 99 percent of horses that started in California last year raced on bute, according to the Daily Racing Form. The pro-slaughter doctors and veterinarians who attempted to refute Dr. Marini et al’s study a few years back expected everyone to accept their supposition even though it exemplified an argument from ignorance, which started out as an appeal to authority, (not unlike Dr. Bobsien’s presentation). Sue Wallis and Dave Duquette (of United Horsemen’s Group and the now-defunct IEBA) asked everyone to accept the word of a veterinarian who is an expert in his own field (Dr. Henneke – body scoring), but who is commenting on a field outside of his area of expertise. Dr. Henneke supports the assertion that bute exits the system completely. So what? He’s not a toxicologist. When you want to discuss the Henneke scale, he is completely qualified to render an opinion. Similarly, if Einstein makes a suggestion about relativity, you’d better listen. If he tries to tell you how to ride a horse, you can tell him to keep his day job. In the US, Canada, and the EU, bute is not permitted to be used for food animals. PERIOD. 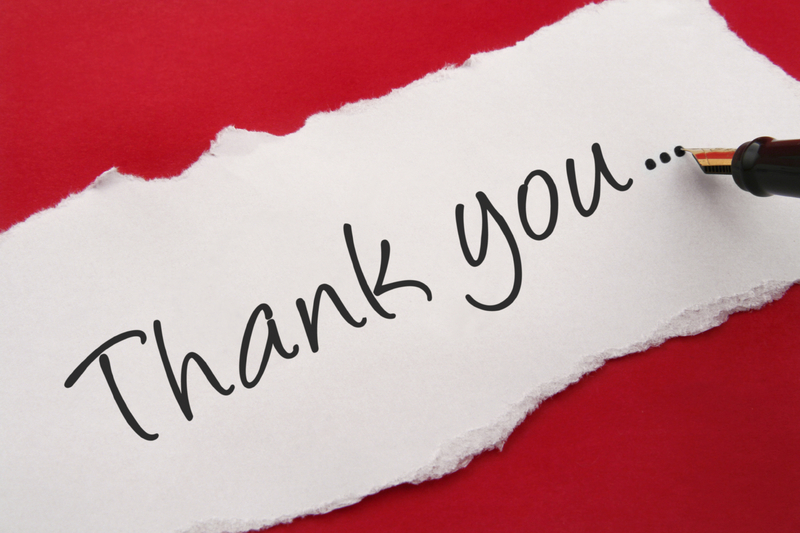 That simple acknowledgement renders any other discussion on toxicology rather moot. There are no safe levels for known carcinogens, which is why it’s pointless to discuss to what degree bute is or is not eliminated from the tissues. Harm is assumed. Discussions of toxicity or “safe levels” are reserved for non-carcinogenic effects. Furthermore, the “precautionary principle” is recognized in international law, and it of course stresses that the absence of scientific certainty about a risk should not bar the taking of precautionary measures in the face of possible irreversible harm. First, do no harm. Horses that are sold to slaughter go directly to slaughter. “No they are held for 180 days.” On the larger feedlots in Alberta there are probably situations where some horses are held for a period of time. But If you look at the Health of Animals Regulations Import reference document, section 5, if imported horses (from the US) are going directly to slaughter they must be slaughtered within 4 days of their arrival. If you have horses coming up from US auctions when does this drug withdrawal take place? When horses arrive at LPN or Richelieu in Quebec from auctions in the US, they aren’t holding them for 180 days – they are killing them within days. Kill buyers, feed lot owners, and transporters are the ‘bad guys’. “Proper blame should be directed towards the persons who overbreed. 5 minutes of terror is better than months of starvation.” Again, why are there only two choices – slaughter or starvation? We can certainly cast blame in the direction of people who produce horses in a “puppymill” type of production line. But everyone is complicit in this sordid business – from sale barn owners, transporters, slaughterhouses, and most definitely kill buyers – all have played a role in facilitating fraudulent transactions and abuse against horses. Many of these individuals and businesses have been fined or packed off to prison for their crimes. Horses should go to rescues instead of slaughter. “Rescues are overfull, unregulated.” That is true even though some are registered charities, but so too are kill buyers totally unregulated, and they have input into the food chain. 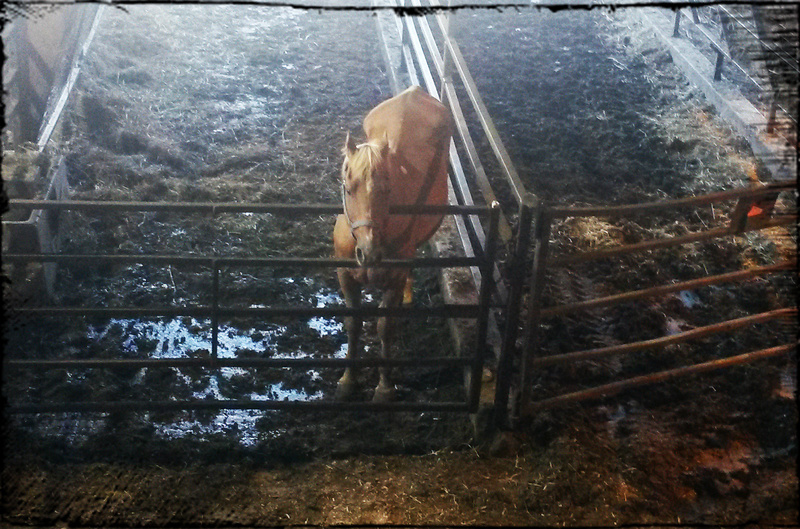 Sales barns sometimes fill out EIDs without input from former owners. I agree that rescues cannot possibly absorb upwards of 100,000 unwanted horses per year. 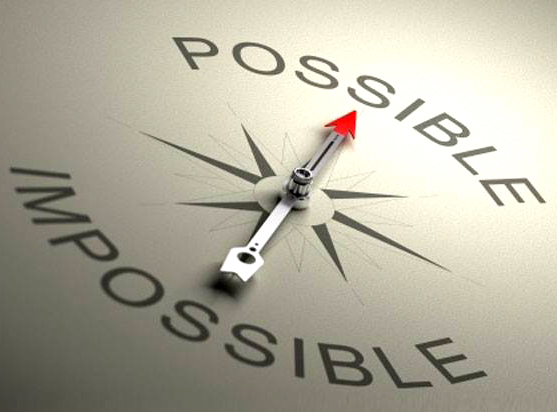 The answer lies in other solutions, including on-farm euthanasia, hay banks, financial support for rescues, and alternative disposal options such as rendering, mortality composting, and biodigestion. Dr. Bobsien herself also pointed this out. From the presentation we could see that the Dr. appears to own a very nice dressage horse that is probably very well trained with nice conformation. If slaughter is not a good enough end for Dr. Bobsien’s own horses, why is it acceptable for others to suffer this fate? This is what anti-slaughter advocates object to – we don’t think it’s an acceptable end for any horse. Neither of the presentations we saw on this day gave any recognition or discussion to the suffering of non-food animals such as horses. It’s obvious that most advocacy by humane groups and SPCAs is focused on advancements for the typical “food” animals such as chickens, cows, and pigs, while little effort is expended to the plight of the unwanted horse. Plenty of criticism is lobbed at the negligent owners and backyard breeders or horses, where it also must lie, but kill buyers seem to get a pass. Neither presenter touched on transport times, live export deaths, injuries, sickness, or pregnancy. Why do some people pull the wings off butterflies, toss firecrackers at cats, shoot the neighbours’ dogs with BB guns (or torture cats with crayfish)? The Dark Triad consists of three personality characteristics—narcissism, Machiavellianism, and psychopathy. You can see it in the painting. 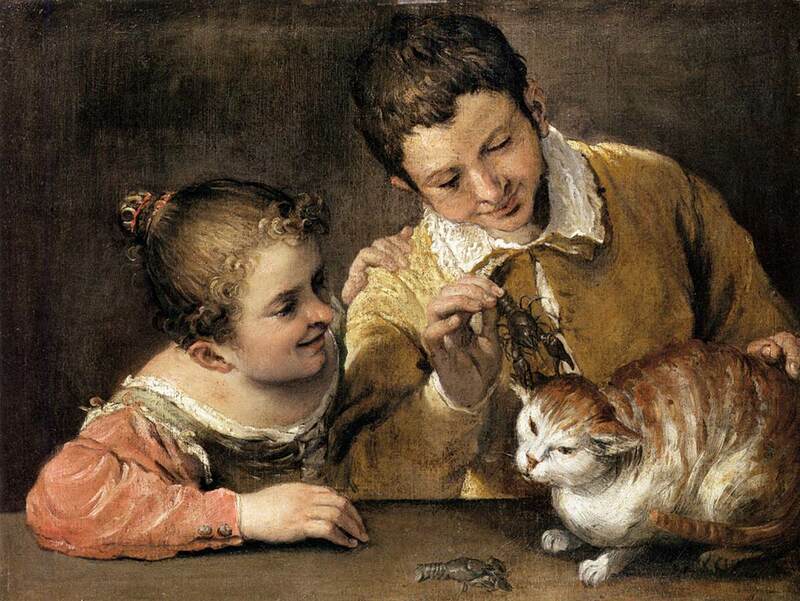 Look at the little girl’s smile as she watches the boy torture the cat with a crayfish. Animal abuse is typically due to the inadequate protection of animals, along with social and cultural factors. Many psychologists and anthro-zoologists argue that animal cruelty is a good predictor of later violence against humans. Therefore, we must address the important psychological and social/cultural issues and make cruelty to animals target of intervention so that we can learn more about the etiology of human cruelty. While animals deserve their own Bill of Rights, many crimes against humans may well have been prevented had any animal cruelty incidents that preceded them been taken seriously. Animals, people, and communities will be safer if animal abuse is detected early and intervention happens immediately with the use of appropriate risk assessment tools and treatment programs created specifically to target animal abuse. The wanton abuse of a dog named Captain is the foundation for this petition, created by animal activist Charlene Myers and (now retired) parole officer Carole DeGrood. Brian Whitlock of Vancouver, British Columbia was convicted on June 12, 2013 of animal cruelty for beating Captain in the head and body with a baseball bat. He was sentenced to 60 days in jail, mandatory psychological counselling and 3 years of probation, but had also been convicted of assault and has subsequently been charged with killing his mother. The petition is intended to be applicable to anyone convicted of animal cruelty under the Criminal Code in Canada. Please help Animal Cruelty Legislation Advocates Canada collect signatures for presentation to the House of Commons. Only residents of Canada (anyone who has lived in Canada for 6 months or more) may sign this petition. The petition form should be printed one-sided only to prevent “bleed” of ink from one side of the paper to the other. Please do not write anything (such as comments) in addition to what is requested on the petition form. Please PRINT the FULL NAME OF THE TOWN OR CITY in which you reside (NO ABBREVIATIONS ARE PERMITTED); Provinces MAY be abbreviated. 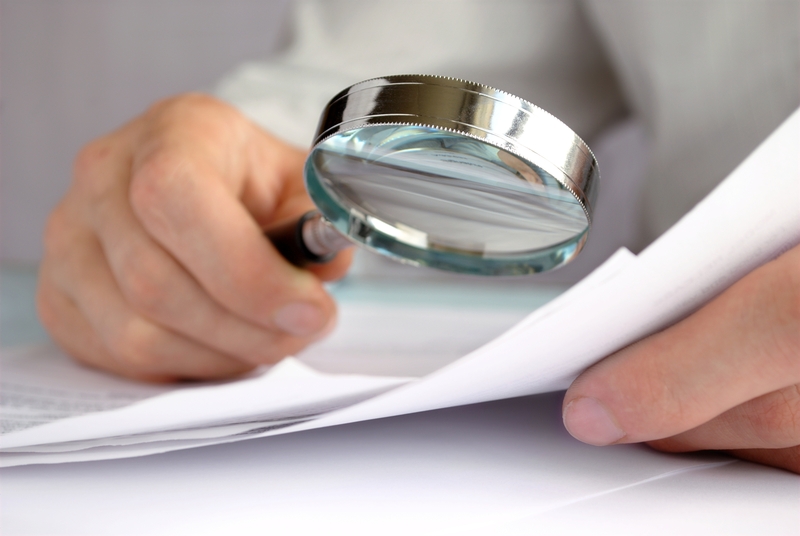 All required information (name, address, signature) is provided on the petition form. Your return address is on the envelope in case it needs to be returned to you for any reason such as insufficient postage. 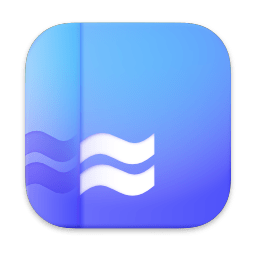 Why is this petition important? 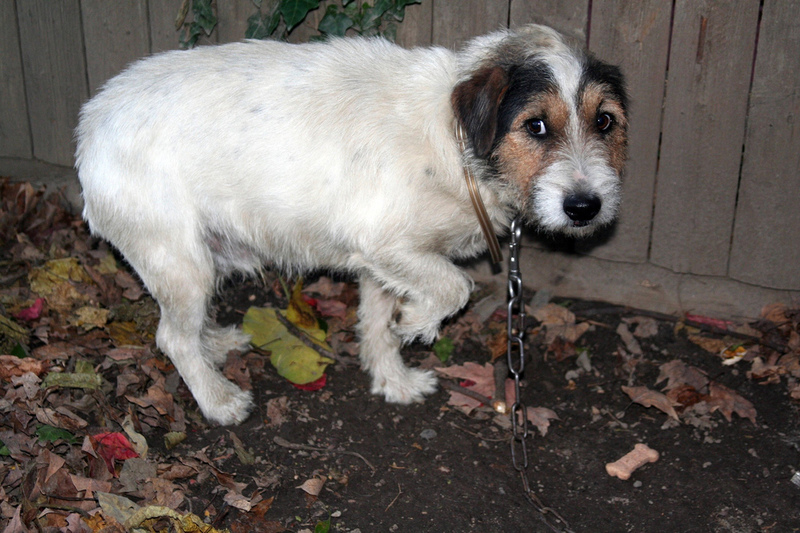 Animals are easy targets for abuse as they are vulnerable and without legal rights. Although the crime of animal cruelty may be viewed by some people as unimportant or trivial when compared with other crimes, studies show that people who harm animals may also be involved in other criminality, including crimes of violence toward humans, either simultaneously or in the future. Furthermore, according to the National Link Coalition animal abusers often kill and abuse pets to orchestrate fear, violence and retribution in homes marked by domestic violence. They add that animal cruelty rarely occurs in isolation—it’s usually “the tip of the iceberg” and frequently the first opportunity for social services or law enforcement agencies to intervene. As a result of recognizing the link between animal cruelty and violence toward humans, animal protection organizations, social services, and law enforcement agencies in the United States have been working together to address the link since the 1990s. Canada seems to be moving forward in this regard but there is more to be done. People convicted of animal cruelty typically still receive minimal sentences and there does not appear to be adequate recognition by the courts and other criminal justice workers of the potential risk animal abusers may pose to public safety. If someone convicted of animal cruelty does happen to be sentenced to significant time in custody, available risk assessment tools and treatment options are not designed specifically to allow the assessor to expose and gather information about animal abuse and the perpetrator’s motives for it. These deficiencies need to be addressed. The Colorado LINK Project found that “an animal cruelty offender’s potential risk to public safety may vary from little to none to extreme” and rec ommends that “animal abuse by adults and children be examined carefully through comprehensive and developmentally sensitive evaluation to help determine the context and seriousness of the abuse, causative factors and the perpetrator’s level of blameworthiness.” As animal cruelty is a crime of violence that is linked to violence against humans, then animals, people, and communities will be safer if everyone convicted of animal cruelty under the Criminal Code of Canada is required to undergo mandatory risk assessment and treatment developed specifically to target animal abuse. This petition calls upon the House of Commons to require that adequate risk assessment tools and intervention programs are developed and that everyone convicted of animal cruelty under the Criminal Code of Canada be required to undergo mandatory risk assessment and treatment developed specifically to target animal abuse. “National Animal Abuse Prevention Day” (NAAPD) Facebook page. John Scott has had a year of highs and lows – since starting into the movie business in 1969, he has balanced his own cattle, horse and buffalo ranch with work on Academy Award winning movies such as Unforgiven, Lord of the Rings, Legends of the Fall and Days of Heaven, along with other films and series such as Hell on Wheels, the 13th Warrior, Klondike Gold, and the family TV series Heartland. Earlier in 2014, he was awarded a 75th anniversary ATB Agriculture buckle (awarded to farmers and ranchers), and soon afterwards it was rather abruptly announced in the July/August 2014 issue of Horse-Canada magazine that he was no longer wrangler for the TV show Heartland. In late 2012, Animals Angels photographed a stock trailer belonging to John Scott Productions at the Bouvry Slaughterhouse in Fort MacLeod Alberta. The feedlots nearby and the Bouvry slaughter plant were part of an investigation by Animals Angels; you can read the full report here. 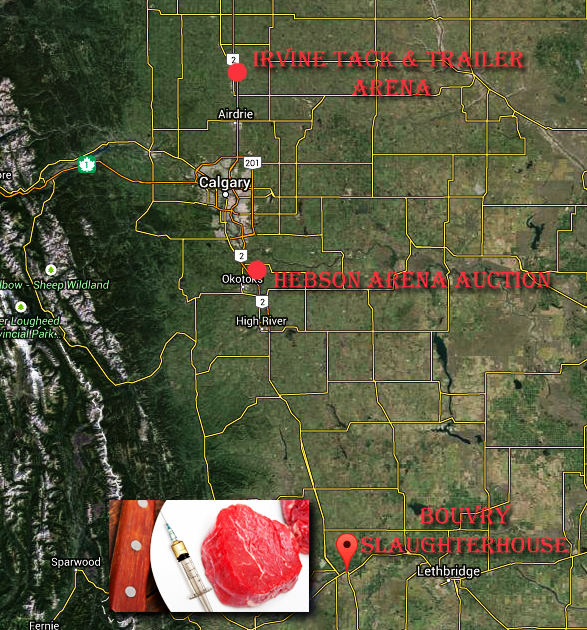 There is also additional footage of the various Alberta feedlots by the Canadian Horse Defence Coalition as part of “The True Faces of Horse Slaughter” investigation. When I wrote my original Heartland blog in March 2013, speculating on whether JSP horses were being sent to slaughter on that day when Scott’s trailer was observed at Bouvry, we didn’t know and still don’t know what species of animal had been taken to the slaughterhouse. 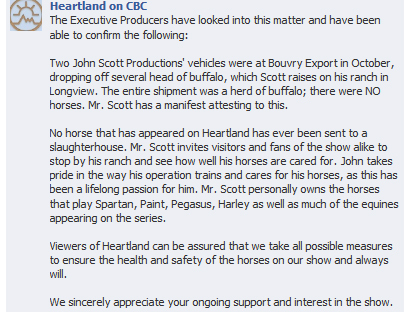 Previously, the Heartland show, via their Facebook page, denied that any horses featured in the show had ever gone to slaughter. But since the announcement that Scott was no longer wrangler for Heartland, it was noticed that horses advertised as being from the series were showing up at various auctions throughout Alberta, in fairly close proximity to the Bouvry slaughterhouse, and usually where kill buyers were present. 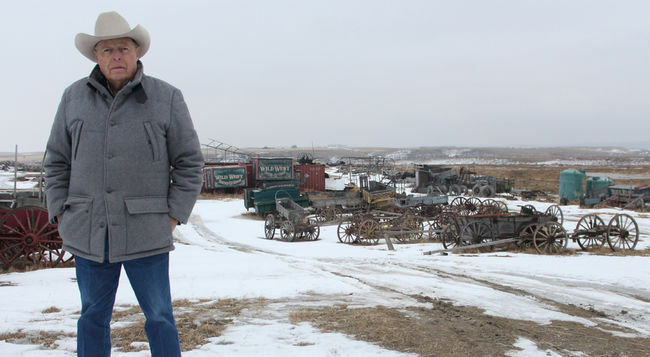 As well as being a supplier for movies, Scott is also regarded in Alberta as a horse trader. In addition to the two auctio n sites mentioned, he also brings horses to the Innisfail auction north of Calgary, where kill buyers are also in attendance. In May and August of this year, John Scott Productions had two partial herd dispersals at Hebson Arena and Irvine Tack and Trailer. 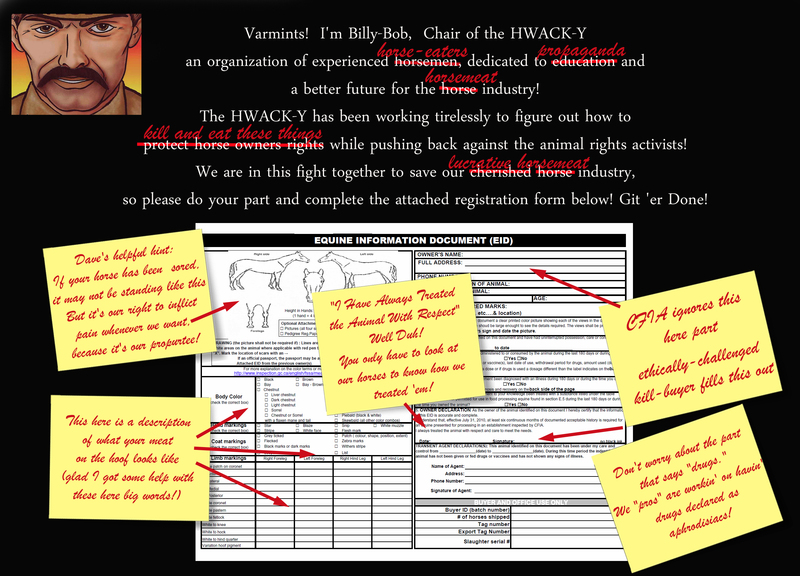 The owner of Irvine Tack & Trailer is Scott Irvine – a well known and very active kill buyer in the province. Having auctions of any animal on a kill buyer’s property puts money in their hands and enables them to slaughter more horses in the long run – it’s the same argument some people use for refusing to purchase brokered horses directly from kill buyers. These two sales, which disposed of dozens of horses and mules, represented a large number of Scott’s usual 150 head of horses. Quarter horses, appys, paints, grade horses, and mules were variously described as having been used as as driving horses (2up, 4up and 6up) reining horses, bucking horses, and used in parades and blacksmith competitions, the Calgary Stampede, various movies including Heartland, and in ranch work. One horse was advertised as being an RCMP horse. Most were in their early to mid-teens, with others being described as “smooth mouth” horses who could no longer take heavy work. After what appears to have been a lot of hard use, most of these well-broke horses deserved a soft landing – to new lives as lightly-ridden trail horses for beginner and intermediate riders. Many of these horses should have been able to bring at least $1,000 each, but obviously Scott would have included some horses who didn’t work out for him or could no longer do heavy ranch work, and therefore aren’t as desirable on the market. Typically the horses described as “best for occasional trail use” don’t do well at auctions because they are often not completely sound. 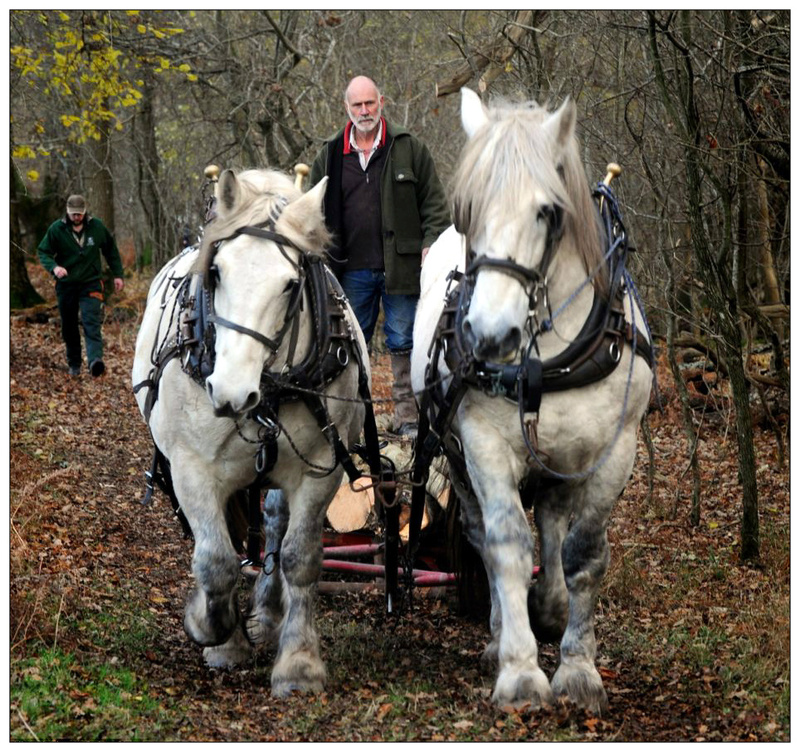 So it’s unknown how many of these horses went on to new homes and whether any may have been sent on that final trip to Bouvry, not far from either of the sites. 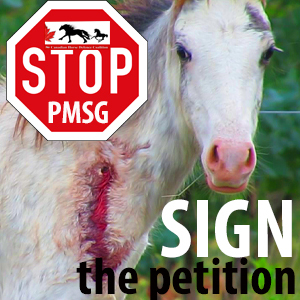 Fort McLeod is the capital of horse slaughter in Canada. Once in a while I get a response to a blog post that really merits its own stand-alone blog. Lauren sent me a response to my blog addressing the ethics of horseback riding, and while she doesn’t agree with my conclusion, I think she raises some interesting points and introduces several new arguments. So I wanted to present her post, which she took a lot of time to compose, along with my rebuttal arguments. Hi Heather, my name is Lauren and I came across your blog post today while doing some research. I am a soon-to-be graduate of Purdue University, am a vegetarian for multiple reasons, and rode horses for 15 years before changing my entire viewpoint on riding. I have ridden in both English and Western disciplines and was once a rated member of the United States Pony Club. I have raced barrels, hacked Saddlebreds, ridden in Western pleasure classes, ridden trails, competed in dressage, and jumped cross-country. 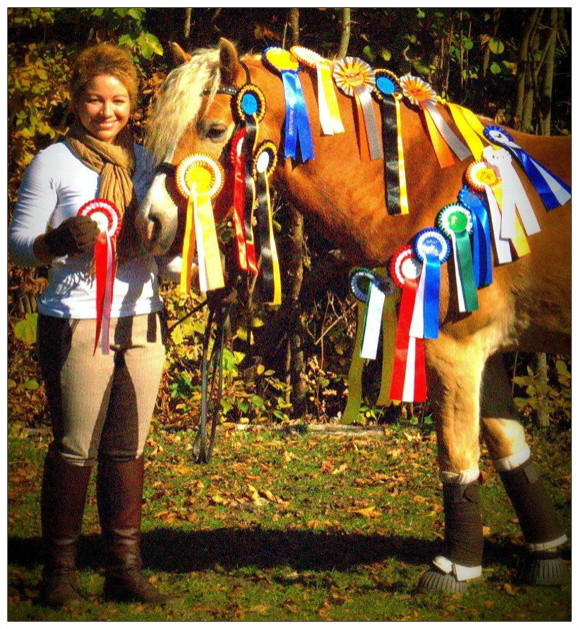 I have probably ridden over 100 horses (I am not joking) from ponies to ex-racehorses. 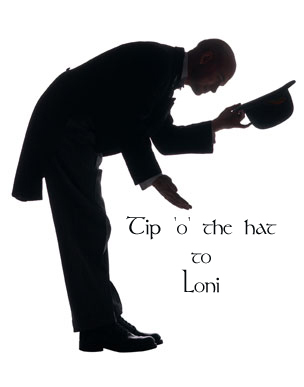 I have also had many different riding instructors over the years including so-called professional riders. I used to attend the Rolex Three Day event in Kentucky every Spring and thought that somehow my poor (seriously) self would find an opportunity to become a professional eventer with some off-the-track-Thoroughbred I’d bought for $300. Then one day I literally walked away from it all and I have not looked back since. 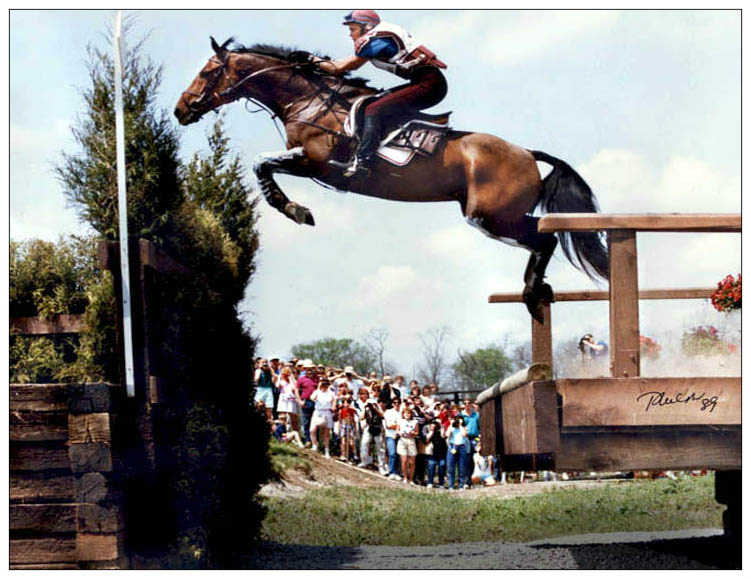 The cross country portion of the “triathlon” is the most extreme equestrian sport, pushing horses and riders often beyond their physical and mental limits. Last September, I saw an article pop up on my Facebook about the organizers of a three day event changing part of a cross-country course half way through the order-of-go. Apparently many of the horses and riders had been having problems at particular jumps due to poor weather conditions. So I posted the article to my feed with a statement that this was unfair because most of the professional riders at the event were at the end of the running order and would now be riding a different if not easier course than the novice riders that went before them. I got some backlash from fellow riders who said the organizers were correct to look out for the “safety” of the other riders once they realized there were too many problems. I insisted that this still wasn’t fair because the riders at the end were more experienced and should know how to “handle” the poor conditions. Still, there were arguments that this change of course was proper for safety. A little angered, this time I pointed out that the whole sport of eventing is dangerous and horses can die. They do die. I was at Rolex just across the field in 2008 when Lainey Ashker’s Frodo Baggins went down over the now-infamous Flower Basket jump. Horses die in this sport all the time and yet we never once ask the horse if he’d rather not go out there and risk his neck for it. 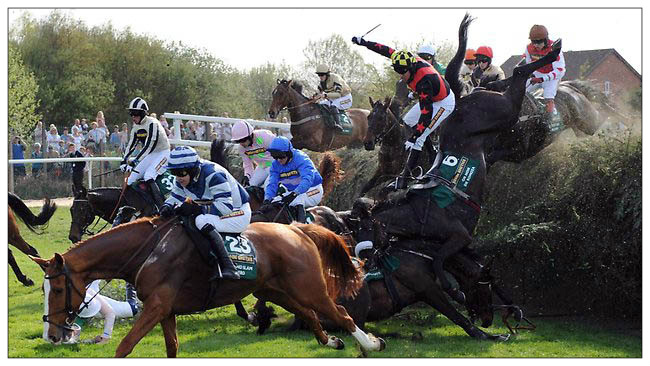 Jumps Racing is obviously reckless with multiple horse and rider fatalities every year. So I began to think about this some more. I’m no physicist, but I realized that any time a mistake is made at a jump it is always the rider’s fault. This is due to the fact that the horse is in no way “designed” to carry a rider (living organisms do not have a defined purpose and neither do their parts; see Diamond v. Chakrabarty which alludes to this legally, and check out the NIH’s stance on this). Any minimal shift in the rider’s weight (which is going to happen), shift of the tack (which is also going to happen) or otherwise (a random act of nature, i.e. 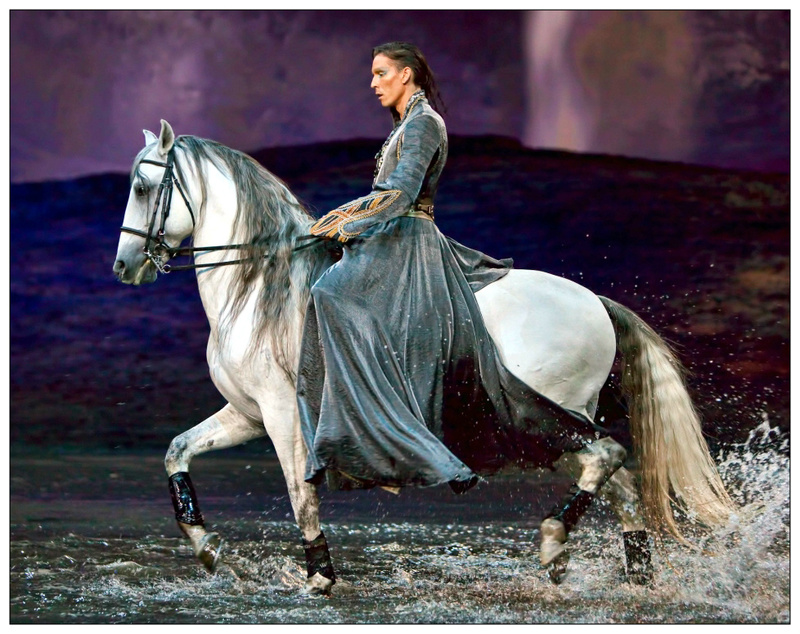 shifting of wind or terrain) can and will throw the horse off-balance. In addition, any perceived “wrong” move taken by the horse in response to the shifting of his balance or active response to shifts in the rider’s weight are often punished by use of the crop and/or spurs. 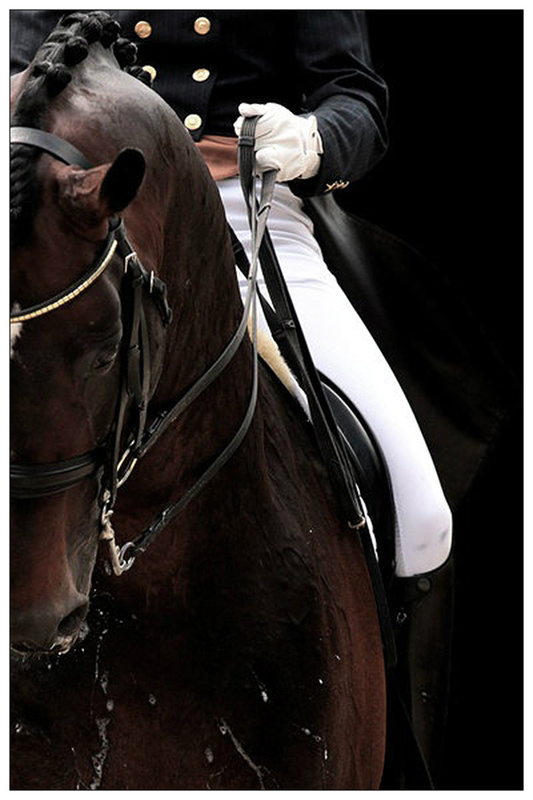 Typically, what the horse is really doing is making an active judgment of the situation to account for rider error (i.e. the shifting of the rider’s weight). 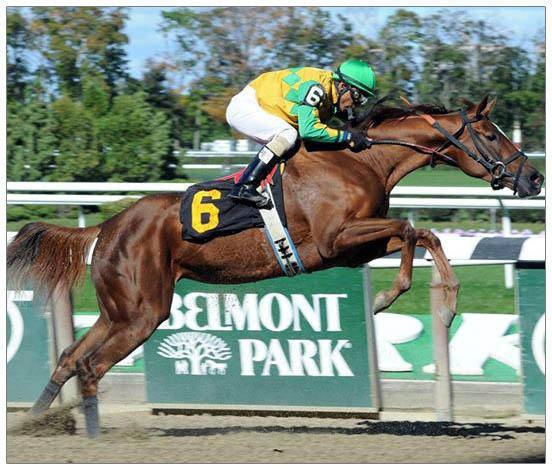 Again, I don’t have science to back me up here, but I would hypothesize that the movement the horse would make on a cross-country course, such as an approach to a jump, would almost always be different from the movements made by the horse with a rider on its back. To complete the example, if you have a horse and rider approach a jump and he suddenly refuses or lunges to the side to go around the jump, he has made a judgment call that he could not safely make the effort without injuring himself. And for this the horse often receives a whack with the whip, a jab of the rider’s spurs, and/or a nasty yank of the reins. The horse made an effort to protect himself – to survive – and he received punishment. An average of 24 racehorse deaths every year in the US – approximately 2,000 horses break-down and have to be vanned-off at tracks. Further, if these event riders have such great partnerships with their horses, why exactly do they need whips, spurs, and/or bits? Some go “nice in a snaffle,” but I’ve seen gags, pelhams, and elevators on the cross-country horse, as well as different lengths of spurs on the rider’s boots and different types of crops in the rider’s hands. I have been to many upper level and lower level cross-country events and at least once I have seen a rider “get rough” with these “aids” in some manner. It isn’t acceptable. We could argue about “good” contact all day, but my question still stands: what are the spurs, whips/crops, and bits for if you have such a good partnership with your horse? Why would you ever need those things to “communicate” “jump this massive fence at a gallop with me on your back?” Perhaps it’s because in the absence of these “aids” the horse would have a much easier time of saying “no” and there goes the “connection” between man and horse. I watched the video and read the Tumblr entry you discussed in your post. Based on the definition of “vegan,” a person who follows this philosophy does not consume any animal products for any reason in any manner whether that is strictly for ethical, health, or other reasons. Hence, riding is not vegan because a human being would be taking something from the horse (energy, a place to sit, engaging the horse as a vehicle for transportation, etc.) and the horse rarely gets anything positive from the experience of being ridden. The viewpoint is clear and there isn’t anything inherently wrong with it either. If there is something inherently wrong with not riding a horse because it is unnecessary or unethical or whatever, please enlighten me. I am not vegan and though I do not ride anymore for the reason that it is harmful to the horse’s well-being, believe me when I say I miss riding horses. I grew up riding and it is something that’s ingrained in my soul for better or for worse. But I have learned that to ride a horse is selfish on my part. I don’t need to ride a horse for any other reason than enjoyment. And when there is overwhelming research to show that riding can harm the horse physically, physiologically, emotionally, mentally, and/or psychologically what reason is there that justifies riding? I do not believe that the research snippets in the video are incorrect even if they may need some more fleshing-out and additional research. I am vegetarian and I do not necessarily equate not eating meat with not riding. However, I think that equestrian competition is exploitation of the horse for human gain at the cost of prohibiting the horse from expressing free will to not participate (and not be punished for the refusal). Competition impacts the horse negatively in many respects and should not be supported. Absolutely any equestrian competition is harmful to the horse. There should never be a situation where, if a fence is not ridden or jumped perfectly, the horse does a rotational fall. Let me take your pet or dog ownership thoughts into account as well. So we say our animals love us, yeah? So same thing as above with the spurs, whips and bits on horses, why do we need leashes and collars for dogs? (I would concede that typically the leash and collar aren’t used in the same manner as the bit and spurs, but that they can be used with severity.) If humans had true partnerships with their dogs (and some do) then we shouldn’t need leashes or collars. When you get down to the bare minimum of the uses for the items used on a horse and the items used on a dog they are each used in a manner consistent with control of the animal. The leash and collar keep the dog from running off and the bit, whip and spurs force the horse to do our bidding when we get on his back. 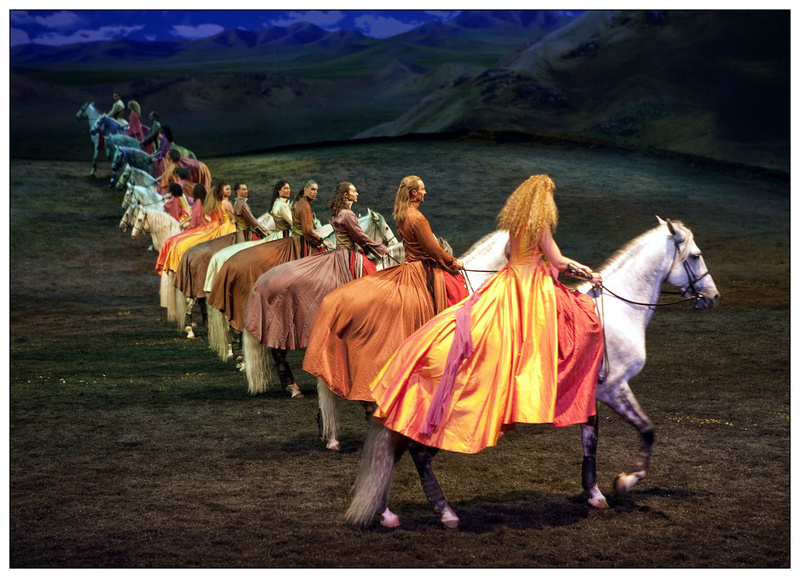 Further, just because horses could carry 25% of their bodyweight on their back (by what study by the way?) does not mean it is designed to do so. Again, living beings are not designed for a purpose. Do you even know exactly why you exist on earth? I can’t even pretend to know that. Studies have also shown that when a horse bares a rider on its back for more than 15 minutes of work this can cause the horse immediate soft tissue damage and pain. If you know of a study that cleanly refutes this please post it. Please refer to the Nevzorov Haute Ecole’s website for information on the study I noted here. While “going for a trail ride” hardly sounds like abuse, if the horse doesn’t have a choice in the matter then this doesn’t make it ok. Just because you don’t think you’re harming the horse does not mean that you aren’t. If you love and cherish your horse why would you take this risk? 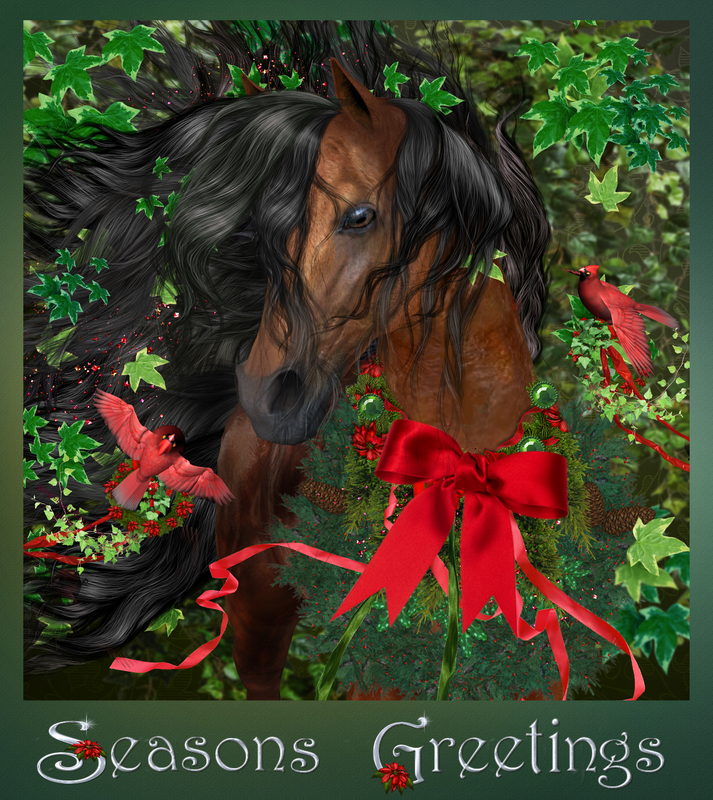 In the “death to carnism” blog, the author does not advocate turning horses loose in the wild. The author states that this would be irresponsible. That is another discussion for another time as well. You’re right about humans harming other animals no matter what considering the world we live in, but this is not a free pass to just hop on a horse and ride it. That’s a hypocritical point of view. If you know you are harming the horse, why would you ride it? If you don’t know, you shouldn’t ride, and you should study-up. First I think we need to define what veganism is – the practice of abstaining from the use of animal products. Some vegans have taken to extending their philosophy in all manner of ways in which the originator cannot have foreseen. I can’t imagine how we can consider the “energy” of a horse as a product of that animal unless that is what one understands to be covered by “ethical veganism.” Vegetarians on the other hand, still consume some animals products, including dairy, eggs, cheese, gelatin, honey, etc. I have to say honestly that I am baffled as to why taking “energy” from a horse seems to be so objectionable to you while consuming dairy or eggs is apparently less so. The demand for dairy has very tangible effects on the cows and calves in that industry, and chickens suffer immensely to produce eggs, much more easily measurable and quantifiable than any presumptive abuse to horses resulting from conventional riding. I do want to affirm a lot of what you’ve written about various horse sports being cruel or inhumane to horses. I do agree that the cross-country phase of eventing at both the international level or at Pony Club are highly dangerous, along with other “sports” such as racing, rodeo, chuckwagon races, jumps racing, and numerous cultural events are all either blatantly cruel to horses or stretch them beyond their reasonable capabilities. 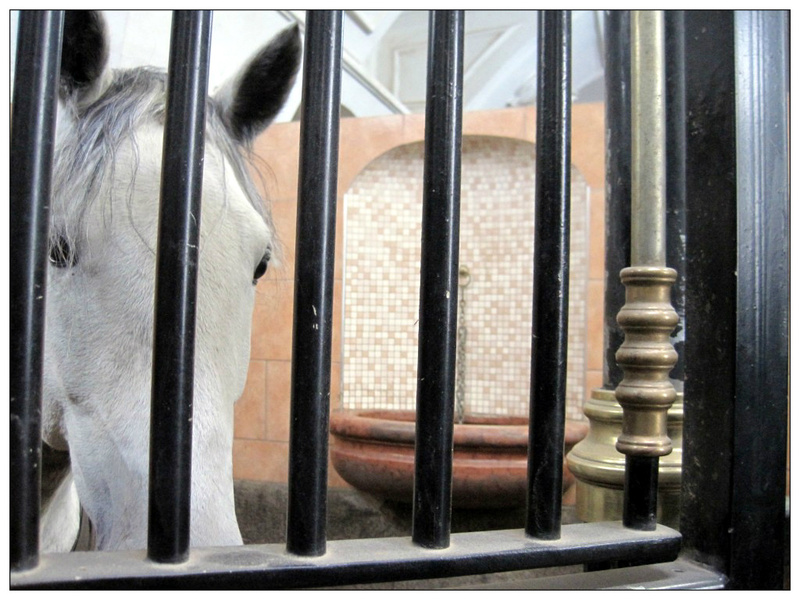 I wrote more about the broad abuses of horses in another blog post. 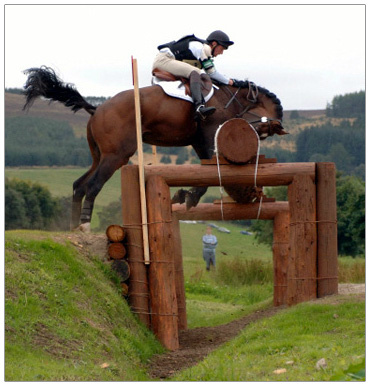 Cross-country courses challenge horses with drop fences, where the horse can’t anticipate that he has to leap straight down, and water jumps compel horses to jump then while not knowing the depth. Until recently, obstacles did not break-away, causing serious falls and injuries (if not death) to both horse and rider. Courses are, IMO far too long and even when horses are matched to an ideal course, they can only run and jump for so long before they are exhausted or injured. Any event where you have significantly less than 100% of the participants fail to complete a course is too strenuous and risky. I don’t agree with you that whenever a mistake is made on a course it is rider’s error. Even a correctly balanced rider’s weight causes the horse to strain to overcome gravity. The horse needs greater impulsion to clear the weight over the fence, possibly over-extending himself on the other side of the jump. A tired horse builds up lactic acid in his muscles and is more likely to sustain injury. Horses can also dehydrate and tie-up even with the most competent riders. I did actually link to a study in the original blog post that concluded that healthy, fit horses could comfortably carry up to 25% of their body weight (saddle and rider) which supports my contention that horses are not physically compromised by the weight of most riders. The ability of an animal to lift weight (whether ant, cockroach, or horse) is determined by the relationship between surface area and body mass. Ants can also lift 50 times their own weight even though they might not need to. Obviously, other factors to consider in matching the horse to the sport are size and weight, condition, fitness, conformation, attitude, ability of a saddle to distribute weight properly, ability and weight of the rider, distance travelled while riding, type of terrain, and temperature/weather conditions. Whips, spurs and bits are not automatically torturous. I don’t use spurs and I don’t think most riders do either. I don’t use a whip except in driving where it must be carried in case the horse backs up into a hazard such as a car, child, or edge or a ravine. The driving whip is used to take the place of the leg aid and is used to signal that a bend is asked for or a change of direction is forthcoming. The floppy end of a driving whip taps the horse with the same pressure as flicking a shoelace on your arm. And if you’re going to have a bit there is a range that are considered good and humane by most riders and clinicians. I don’t believe that halters cause a horse any pain. Most higher level dressage riders use spurs subtly, but their use by less skilled riders is apt to be punitive or abusive. You claim that there is overwhelming research that riding harms horses “physically, physiologically, emotionally, mentally, and/or psychologically?” You didn’t provide any evidence for this to prove your point. I have seen some vegan sites post a link to research that consisted of evaluating a horse’s back for Kissing Spine, otherwise known as impinging spinal processes in the back, which is largely congenital. One vegan blogger cited it as a condition she assumed was directly caused by riding. I tried to correct the assumption, but it seems she was too cowardly to moderate my post. Impinging spinal processes need to be evaluated to determine whether a horse can be ridden, and as you know, horses will absolutely tell you when they are in pain. Humans are self-legislative, morally autonomous beings. It does not follow from this that we are morally free to do anything we please to animals. 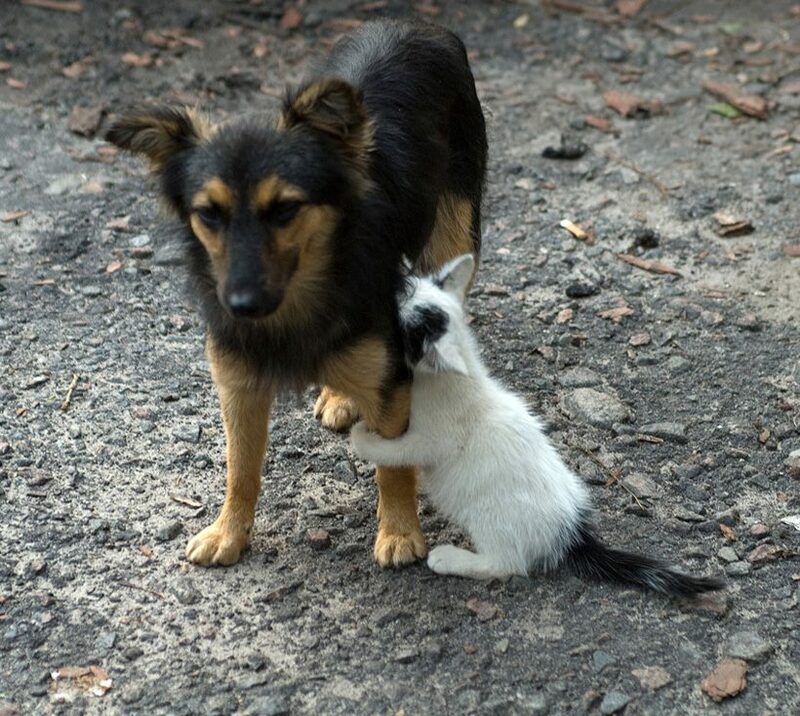 However, if we required permission from an animal to take any action on their behalf then we could not spay or neuter them, walk them on leashes for their own safety, nor could we anaesthetize them to clean their teeth, vaccinate them, keep them on leashes safe from traffic, trim their hooves, or euthanize them when terminally ill. If we choose not to do any of these things because we don’t have permission, then we’re missing the point of being ethical and compassionate human beings. Alexander Nevzorov is simply another clinician, one who has attracted a cult following. Quite frankly, he makes my head explode. Because he has attracted extremists, he thrives in that environment and turns off people who are interested in his methods but not the extremist attitude. He and his followers won’t allow discussion of other methods. He is in favour of abolishing equine use (and equines) period. There are a number of other things that Nevzorov is also quite strident about that do not fit with my concept of good and ethical horse welfare. His videos depict all the worst aspects of riding that many horse people would like to abolish – racing, rollkur, over-horsed riders balancing themselves on the bit, sometimes with nervous, perhaps improperly trained horses, rodeo, etc. The videos imply that this is the norm. Nevzorov and his wife are even opposed to improvements in horse sport because to them it means they won’t be able to abolish it as soon as they would like. This is rather comparable to being opposed to the discontinuation of gestation crates for pigs while waiting and hoping that people will stop eating meat. They are opposed to the use of the Dr. Cook bitless bridle. They also have no interest in rescuing horses, possibly since they feel that the sooner horses become extinct as a species, the better. They are opposed to any breeding of horses at all, which again means in their world the domesticated horse is an extinct horse. 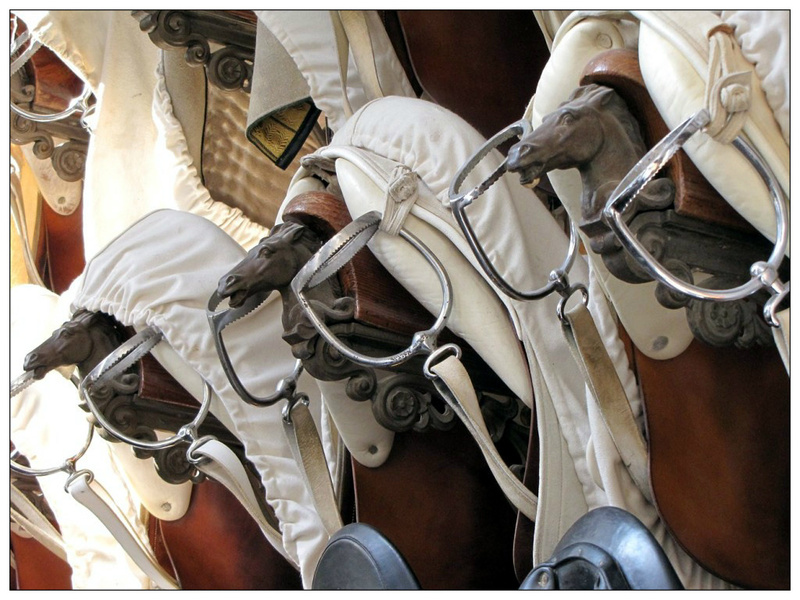 You make the assumption that before he stopped riding horses he rode without confining the horse’s head with a bridle. This is not true. Nevzorov rode horses in the traditional manner with saddle and double bridle. 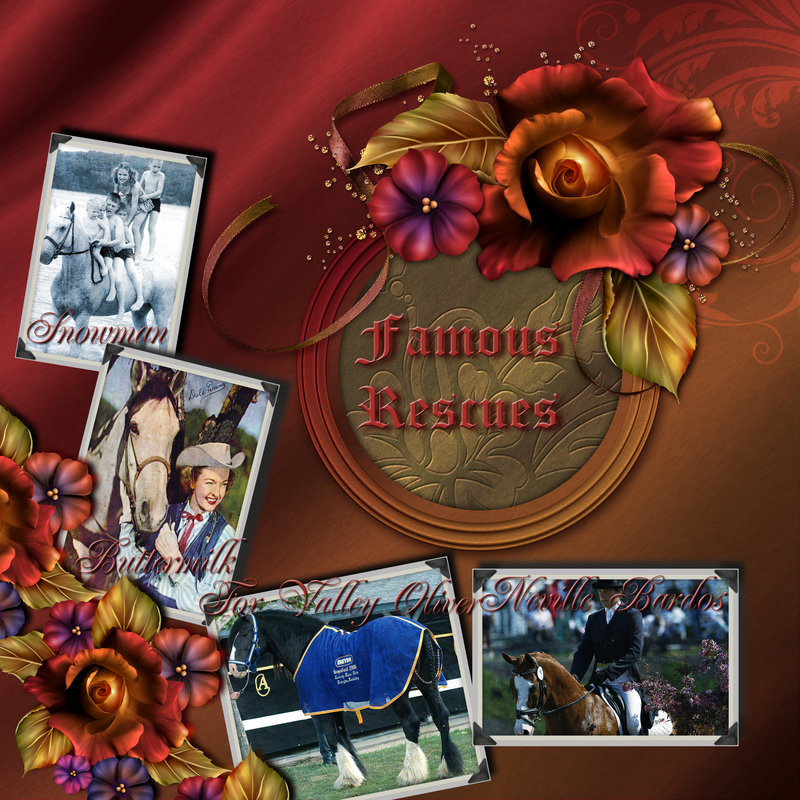 There are numerous pictures of him on the web using traditional horse tack which often included whip and spurs. What most of his followers don’t know is that the horses you see him performing with were all trained traditionally under saddle and with a double bridle, whip, and spurs. If he can accomplish the same level of training with a totally green horse and without resorting to any other methods but what he’s condoning now, I’d be impressed. While I agree with many of his statements about whips, harsh bits, rough handling, etc. he claims to have taught his horses to understand Latin (which is really a written rather than spoken language). This is crackpottery of the highest order. PeTA’s endorsement of horse riding is relevant since they are probably the most radical of the major animal rights/welfare groups (ASPCA/HSUS/MFA etc). 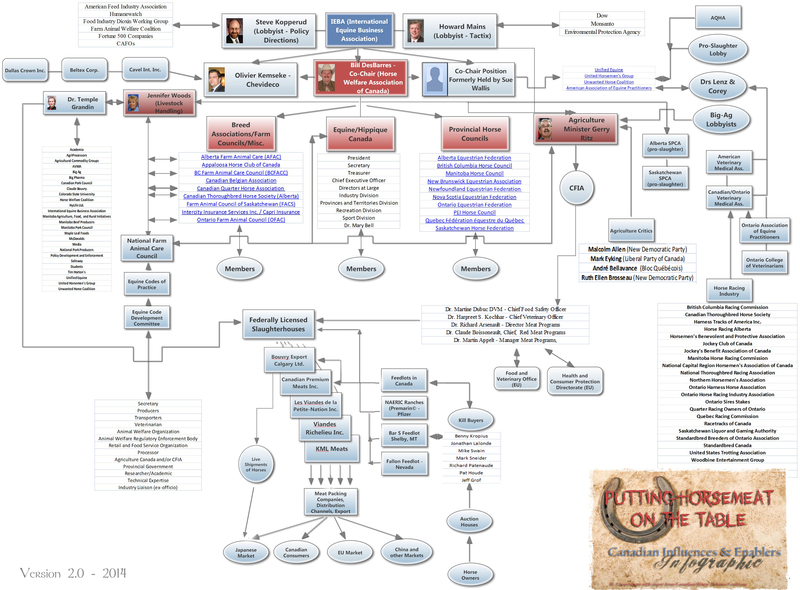 Some of Nathan Winograd’s Huffington Post pieces have been shared over 100,000 times by many people who never question the veracity of his claims about PeTA. The “PeTA Kills Animals” phenomenon was a hoax perpetrated by the Center for Consumer Freedom, a deceitful outfit that protects the interests of animal enterprise industries. They created the hoax to mitigate PeTA’s impact on their meat and biomedical industry clients’ profit margins. Not so admirably, others have jumped on the “PeTA Kills Animals” bandwagon to mitigate that organization’s impact on their agendas. Nathan Winograd falls into this category. Rather than address head-on PeTA’s concerns about dangerous and ineffective “No Kill” initiatives, Winograd uses the “PeTA Kills Animals” meme to change the conversation. Unfortunately, for animals in many “No Kill” shelters and rescues, PeTA’s concerns that the “No Kill” movement is causing them harm appear to be valid. 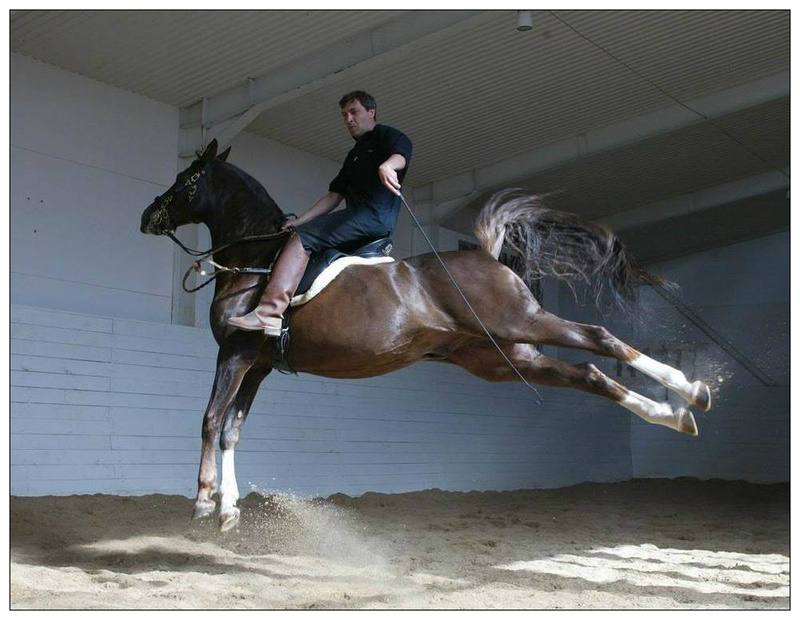 Alexander Nevzorov back in the day when he rode horses, using a bridle, dressage crop, and spurs. “The small, hands-on facility at PeTA’s Norfolk headquarters isn’t a traditional animal shelter, but by comparing it to one, PeTA’s detractors are able to make it seem like PeTA’s euthanasia “numbers” are very high and somehow very bad. PeTA’s shelter operates for the primary purpose of providing no-cost, humane, veterinarian-supervised, medical euthanasia to suffering community animals who require it. This service is offered on an emergency on-call basis only, and it’s not advertised in any way. PeTA’s Virginia Department of Agriculture and Consumer Services animal reporting data and shelter inspection reports confirm that nearly every animal PeTA receives for euthanasia is received from his or her guardian for this service. There is no indication that these guardians aren’t acting in their animals’ best interests by requesting this service from PeTA’s shelter, or that it’s in any of their best interests not to be immediately euthanized. 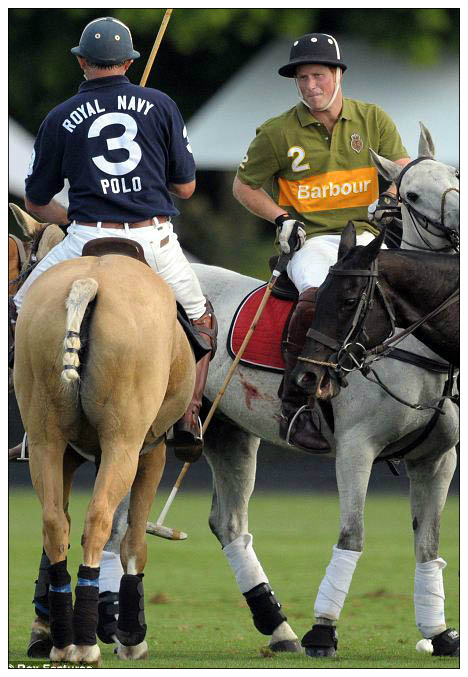 Polo is another extreme sport – here, Prince Harry draws blood with his spurs. Virginia’s State Veterinarian, Dr. Dan Kovich, DVM, MPH, acknowledged the gap, during our recent interview. “There are several communities that are underserved by veterinarians, or don’t have access to a veterinarian at all,” Kovich stated. “Shelters that offer owner-requested euthanasia are providing a valuable service to the community,” he further explained. Winograd was so deceptive in his HuffPo articles on PeTA, that he was served with a Cease and Desist letter. Similarly, another Huff Po Blogger who wrote extensively and critically of PeTA, Douglas Anthony Cooper, also acknowledges receiving a C&D. PeTA also took action against posters hiding behind anonymous profiles libelling them on HuffPo, which may have contributed to HuffPo’s decision to abandon anonymous commenting on their site in favour of the Facebook social plug-in. In short, there is little reliable information about PeTAs practices to be found on the Huffington Post at all. So Lauren, my belief is that one should ride lightly, cue as lightly as possible, less is more, and critical thinking needs to be employed when reading these articles. When people specialize in extremism, they expend massive energy in conflict with other groups who are quite close to their ethical position: they are fighting over the little things, and losing the battle against the rest of the world. This is true for both Nevzorov and Winograd. I don’t know about Nevzorov, but try politely disagreeing with Winograd on his Facebook page and he will lecture and then ban you immediately. That’s one reason Parelli and Rashid and other clinicians are so successful – we may not like all of their teachings but they preach to the middle of the roadists. Whoever captures the middle ground will have the greatest support base and opportunity to improve conditions for horses. The extreme groups are left to fight over the margins. Nevzorov and Winograd both have valid points, but I’m not interested in personality cults.